As summer winds down, SIGH!!! I start to think about bringing some outdoor plants inside for the winter and about adding some new plants indoors. 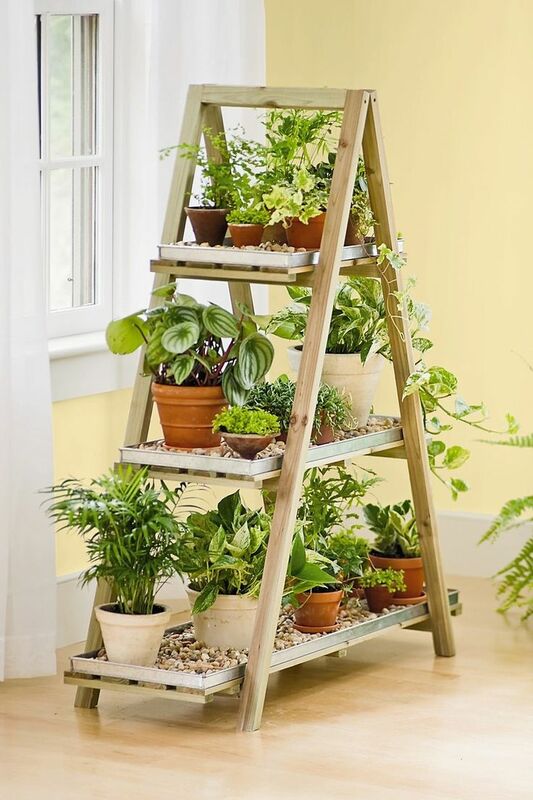 I love the idea of repurposing an old ladder or building a new one to keep those precious plants over the winter. side story here. My oldest daughter told me a few years ago that she loves terrariums and couldn't figure out why. What she didn't know was that back in the 70s, when she was a baby, she had a terrarium in her room that looked just like this. 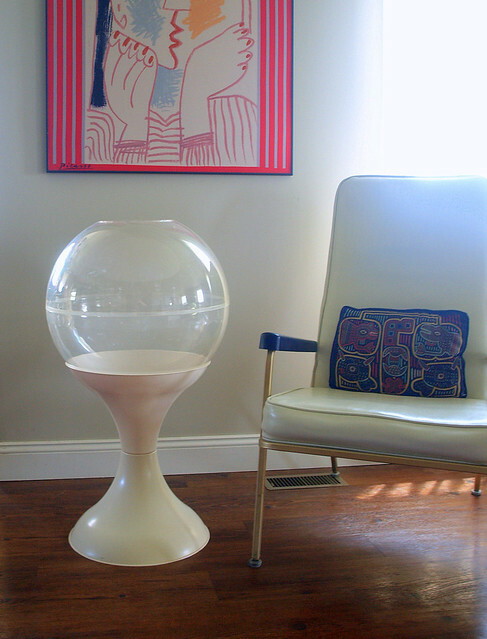 I think both of our tastes may have evolved, although I kind of wish I had that old terrarium back. Okay, now that I have completely gotten off track, strolling down memory lane. I love these. I always called them airplane plants, but I'm not sure if that is the correct name. I know one of you can tell me. You can take the babies and root them in a glass of water. 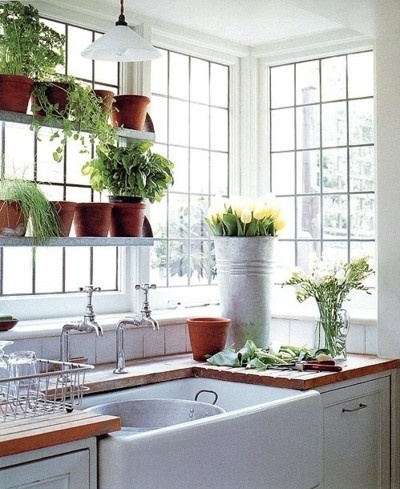 Pretty soon you have airplane plants all over your house. If I seem like I may have been carried away with this at some point in my life, you're right. There must be an airplane plant support group somewhere. 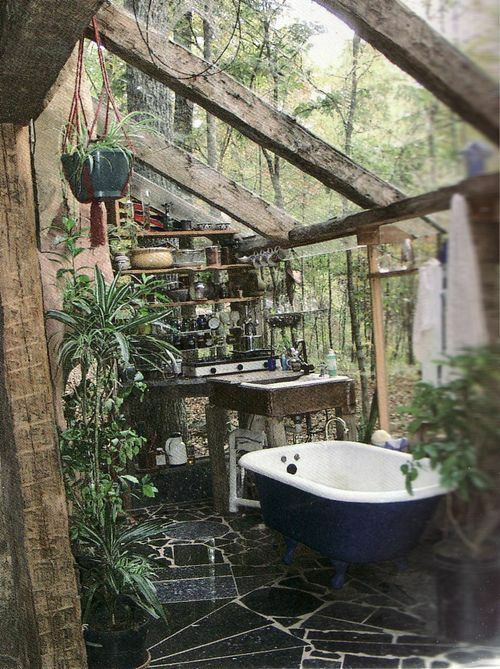 A steamy bathroom is a perfect indoor environment for plants, although I'm thinking I might not be bathing in front of those windows. 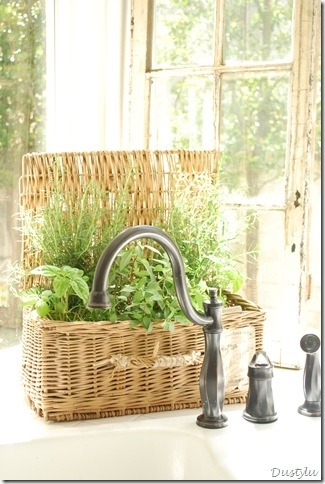 Herbs in the winter are a must for me, so I have to have a kitchen herb garden. 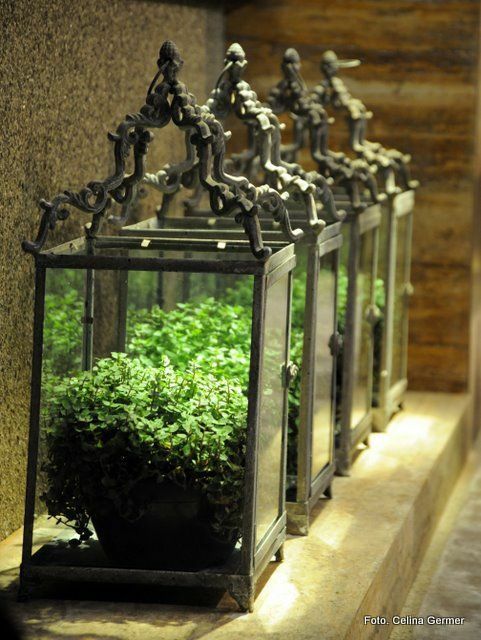 For more indoor garden ideas join me here. 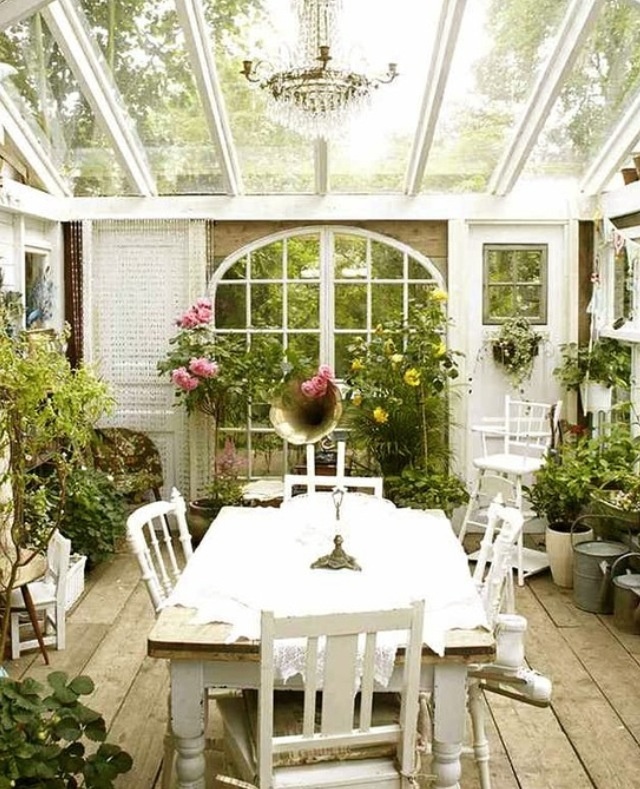 Great pix-- wouldn't mind having that 70s terrarium myself! Beautiful photos. The terrariums are lovely. I remember those terrariums like you showed! I'm sure it is in her subconscious which is why she's drawn to them. 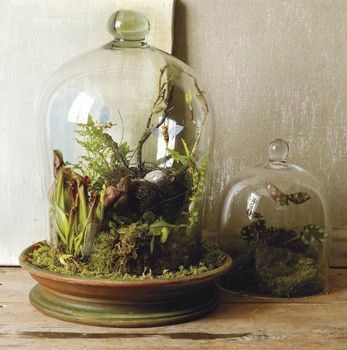 Terrariums were all the rage back in the 70's! I do like them still today and have notcied they've made a big comeback. I think your "airplane" plants are also called "spider" plants. I recall them looking the same except sometimes the leaves were verigated. Luckily my husband takes my geraniums to his business every year for the winter! You caught me red handed this morning, Laura. We were expecting company last night and I looked at the poor wan begonia beside my chair. Aha! I had three blooming on the terrace in the same size pot. One quick switch was all it took. Enjoy your weekend. 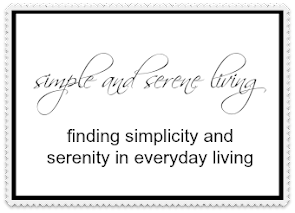 Some great ideas here--I'll try some of them!! I love plants, too. Always have since my mother had a lot of house plants when I was a kid. I think you are referring to spider plants (and I am sure there is a botanical name for them that someone knows). I had a huge one that I hung outside and forgot to bring it in before frost- UGH! Love the ladder! I don't do very well with houseplants. My brother once told me all my plants looked like candidates for Last Rites. Sad, but true. I am great with plants outdoors. Every time I have tried indoor plants they die. Not kidding at all. I don't know what happens. They start out thriving and I put them in the right spot for light and BAM they start to die. I water and feed them, BAM they start to die. I gave up indoor plants a long time ago. Have a great weekend!! Diana is right - those are spider plants. I used to have them in the 70's. I haven't seen one in years. I need to make a terrarium. Hi Laura....Loved this post. Great photos you shared. 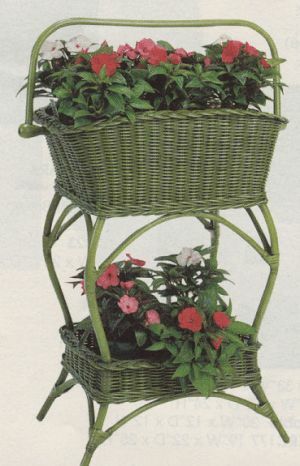 I've been thinking about bringing my geraniums in too. What great inspiration! Love those lanterns!! I had a wonderful herb garden in Idaho, but I don't have one here yet. Can't wait to start one. Have a great weekend. 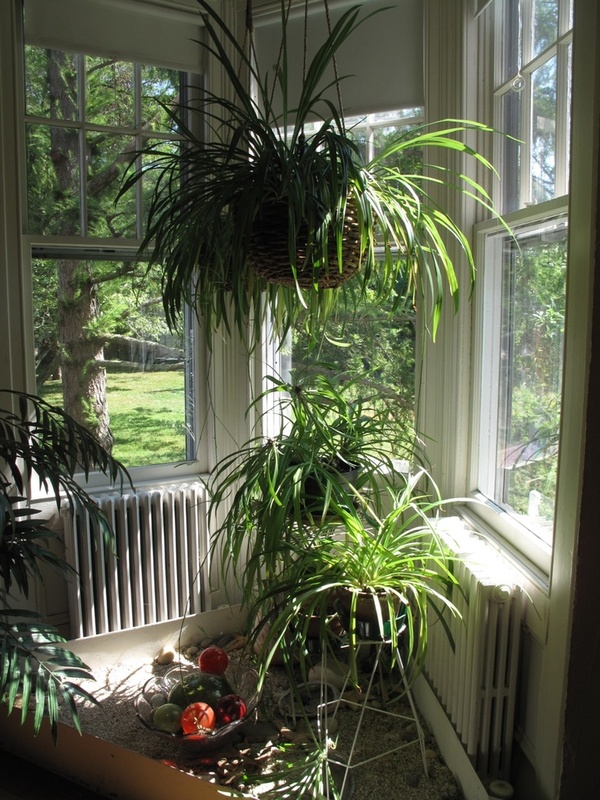 The spider plants are also great for taking toxins out of the air...they have done studies on them, and they are one of the best for doing that. Yes, I'm not sure I would be tubbing in front of all those windows either...unless there were tons of bubbles. I wish I could keep my indoor plants looking this nice. By the way the large plastic ball on the white stand was actually a product display for cough drops if I remember correctly. I worked in a drug store at the time and we were all fighting over them to take them home with us when empty to use as terrariums.